Compare the two photos. The top one was taken on June 3, 2018, the bottom one taken a year earlier on June 3, 2017. 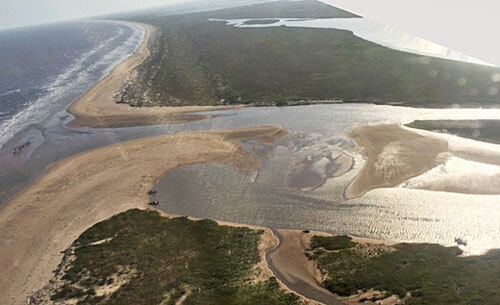 >>> Showing the effects of Hurricane Harvey, the river inches it way over a sand-clogged mouth to the Gulf. Use caution in this area - not navigable by boat. 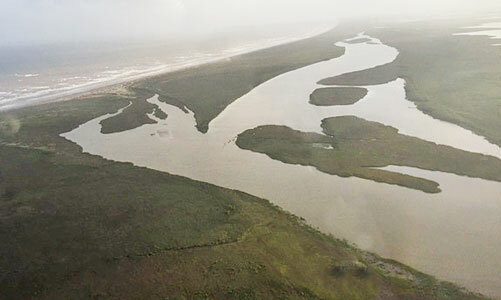 >>> A year earlier, on June 3, 2017, before Hurricane Harvey flood waters temporarily blew open the plugged mouth, the river meanders to the west trying to find a way to the Gulf.